The first casualty of the new RoboCop is a sense of humor. During the opening studio logos, the MGM lion’s roar is replaced by Samuel L. Jackson clearing his throat; like Ron Burgundy’s obnoxious warmup routine, Jackson’s character, Pat Novak, is getting ready for his news program. It’s an inspired bit, but it’s all downhill from there. A moment to revisit the original 1987 movie is warranted here. Violence, political and social commentary, wit — Paul Verhoeven’s film still works well 27 years later. In some respects, like Terry Gilliam’s Brazil, it’s even more relevant now than it was upon its initial release. Sure, some of the special effects (and hairdos) are dated, but it was so successful because it was more than the standard cops-and-criminals shoot-‘em-up. And, since then, Detroit really has filed for bankruptcy. The 1987 RoboCop made fun of the media, commercials and junk TV while also telling a sci-fi story about a cop salvaged from death and restored as a robot, dealing with the changes in his relationships quickly and eloquently while also seeking revenge against those who put him in his full metal jacket, all bundled together with some very clever visual gags. Verhoeven (Dutch) was followed by Irvin Kershner (British) at the helm of the weaker RoboCop 2, then American Fred Dekker dumped RoboCop 3 into cinemas before the series was rendered obsolete. Now Brazilian Jose Padilha has brought an upgraded model to the big screen, complete with an IMAX presentation, spiffy visual effects and international settings. 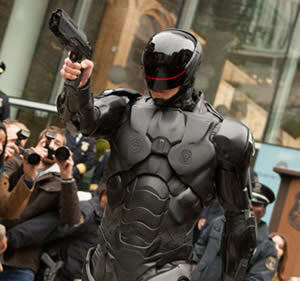 The new RoboCop is essentially the same story as the original, but with a modern twist. Taking place sometime after 2019, the conceit here is robots have been put into war zones as a type of hurt locker to scope out bombs and concealed weaponry. The thought, then, is to expand the use of those robots to another war zone, the mean streets of Detroit, where the war on drugs and crime is a losing proposition. The familiar storyline falls into place once the story moves from Tehran to Motor City, with some dealer-installed modifications. There are political controversies surrounding the use of non-thinking robots to enforce the law. Looking for a marketing gimmick and a way to navigate around the law, Raymond Sellars (Michael Keaton, Batman Returns) latches onto the humanistic science experiments of Dr. Dennett Norton (Gary Oldman, The Dark Knight Rises). Dennett has made groundbreaking discoveries in connecting an amputee’s emotions to mechanical prosthetics. As before, Detroit police officer Alex Murphy (Joel Kinnaman, Easy Money) enters the picture, this time the victim of a car bomb planted by a generic drug lord. No, the drugs aren’t generic, the drug lord is; one of the failures of this new movie is its inability to draw compelling characters. In the original, it’s worth pointing out, the criminals who destroyed Alex’s life were bad to the bone and wreaked havoc all over town. One of the biggest problems with the 2014 spin is a ludicrous expansion of the Murphy family storyline. In the original, there’s a poignant and simple visit to Alex’s family home after he’s transformed into RoboCop. He realizes that prior life is long gone. This time, Alex’s wife, Clara (Abbie Cornish, W.E. ), is brought in every step of the way and she seems rather unfazed by her husband’s new organic-to-manufactured ratio. She’s determined to maintain their relationship and make sure Alex remains involved in their son’s life. 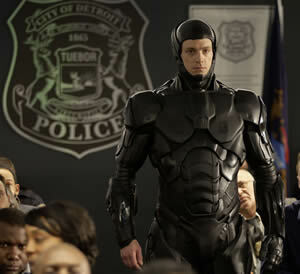 Compounding the challenge of sitting through this RoboCop is the woeful lack of humor and satire. That duty is left solely to The Novak Element, which features an awkwardly coiffed Jackson spouting off about robophobes and playing the broadcast bully, akin to Bill O’Reilly and The O’Reilly Factor. Fine. The joke is obvious and it quickly runs out of gas. Jackson eventually devolves to his old foul-mouthed Pulp Fiction shtick and he manages to take a small role from great to grating within a couple overlong scenes. At least there most certainly is no mistaking Samuel L. Jackson for anybody other than Samuel L. Jackson. Given the proliferation of the Internet, mobile devices, selfies, sexting and reality TV, there’s plenty of new fodder to be mined in a satirical spirit. Instead, this reboot is exactly what it shouldn’t be; it’s nothing more than a standard cops-and-criminals shoot-‘em-up. Okay. It’s not all bad. The lead cast members are really good, particularly Oldman as Dennett, the well-meaning scientist. It’s good to see Keaton in a major role again. Both Kinnaman and Cornish make the most of their roles as Mr. and Mrs. Murphy. And freshman screen scribe Joshua Zetumer puts in a valiant effort to make the science and the technology at least sound like they’ve been thought out. As part of Raymond’s desire to appeal to both the peasants and the politicians, it’s a nice touch to get into the nitty-gritty elements, such as having the human emotions switch off and military software kick in when RoboCop’s visor is lowered. That, along with a lot more extravagant visuals of Alex’s new life-sustaining ecosystem take on vibes of David Cronenberg’s early horror movies (and Cronenberg almost directed the original). Nonetheless, it’s a case of the sum of the parts being less than the whole. So many missed opportunities to truly bring the RoboCop vision into the new millennium make it feel more like an old toaster oven instead of raging hit pot boiler.